I warrant and acknowledge that I am the parent or legal guardian of the player above, a minor (“Player”), and on behalf of myself, Player and our heirs, assigns and next of kin, I hereby enter into the following agreements IN CONSIDERATION OF Player’s being able to participate in any way at practices, games or other activities (“EVENTS”). DISCLAIMER, ASSUMPTION OF RISK AND WAIVER: I acknowledge that participation in soccer necessarily involves travel, play in adverse field conditions, contact with considerable force, and risk of severe, permanent physical injury including bruises, scrapes, strained, sprained or torn muscles, tendons or ligaments, broken bones, dislocation of joints, concussion, brain damage, nerve and spinal cord injury, paralysis and death. I WILLINGLY AND VOLUNTARILY ASSUME ALL SUCH RISKS. I willingly and voluntarily agree to comply with the stated and customary terms and conditions for participation and, if Player or I observe any concern in Player's readiness for participation in the EVENTS, I will remove him/her from participation and bring such concern to the attention of the nearest official immediately. I HEREBY RELEASE, DISCHARGE AND AGREE TO HOLD HARMLESS, to the fullest extent permitted by law, East Providence Youth Soccer Association, its players, employees, volunteers, officials, sponsors and other representatives and any and all owners, lessors, lessees or other persons or entities allowing, permitting or authorizing the use of facilities by East Providence Youth Soccer Association and the agents, employees, officers and directors of said persons or entities (“RELEASEES”) from any and all claims, demands, costs, expenses and compensation arising out of or in any way related to an injury or other damage that may result to said participant or to members of my family or my household or individuals I invite or for whom I am otherwise responsible while participating in or present at any of the EVENTS, WHETHER ARISING FROM THE NEGLIGENCE OF THE RELEASEES OR OTHERWISE. 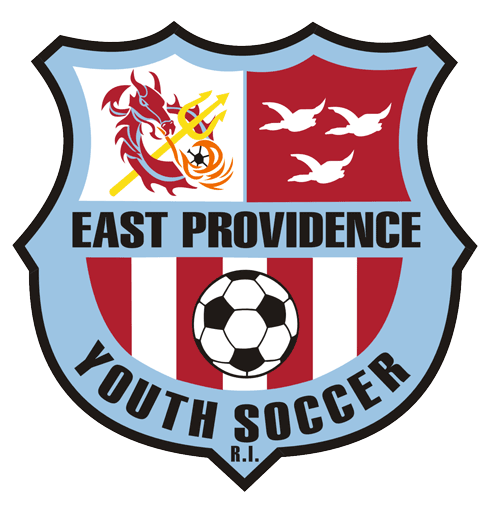 I further acknowledge that East Providence Youth Soccer Association is primarily administered by volunteers rather than paid professionals. I further acknowledge and accept that this Disclaimer, Assumption of Risk and Waiver is intended to be as broad and inclusive as permitted by the laws of the state in which we live and agree that if any portion of this Disclaimer, Assumption of Risk and Waiver is deemed to be invalid, the remainder will continue in full legal force and effect. The East Providence Youth Soccer Association has my permission to use my or my child’s photograph publically to promote the soccer club. I understand that the images may be used in print publications, online publications, presentations, websites, and social media. I also understand that no royalty, fee or other compensation shall become payable to me by reason of such use. Click Submit Only Once - You will be transferred to PayPal to complete your payment.